This is an evaluation board for the MLX90614 IR Thermometer. The sensor is connected to an ATmega328 running at 3.3V with a STK500 (Arduino) 8MHz bootloader. Code can be loaded through the FTDI basic interface and the Arduino environment. 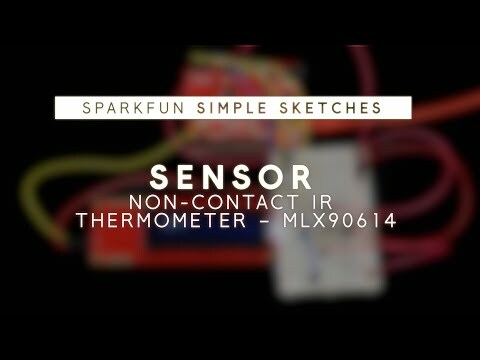 The MLX9061 sensor is a high precision, small size, single zone IR thermometer with an optional SMBus (two-wire) or PWM interface. The ATMega328 comes with demo code that gives a temperature readout in degrees F at 38400bps. You can use a 3.3V FTDI Basic to connect to the board. This revision corrects the silkscreen error on the FTDI header. We’ve also added pull-up resistors to the I2C lines.